Roy Makaay won’t be mentioned very often when we look at the best strikers of the past decade for the above reasons. He also had the misfortune of breaking out when Ronaldo was breaking in and entering his second prime. Furthermore, he wasn’t a particularly great national team player, netting a measly six goals in 43 caps. Add in the fact that the German league wasn’t exactly dominating the airwaves during the 2000s, and you’ll find rabid football fans today who have no idea who Makaay is. This was all triggered from a forum topic asking who the best ten strikers of the past decade were. Immediately listed were the aforementioned goal machines, as well as the likes of David Villa, Samuel Eto’o and Diego Forlan. After several posts, I was shocked to see Roy Makaay completely left out of everyone’s list. Not even a passing mention was given to the former Golden Shoe winner. But why is he forgotten so easily? Would he be more popular if he stayed in Spain and played for the likes of Madrid or Barcelona? Or if he transferred to the Premier League to duel with Henry and van Nistelrooy? Makaay after his record-breaking transfer to Bayern. He possessed one hell of a right foot and could score just as well with his head. “Das Phantom” wasn’t a joke moniker, but a rightfully earned nickname that attested to his qualities. He could spring at any moment and score a scorcher from just inside the box. And he would do it elegantly. 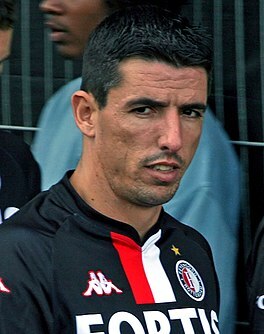 Makaay was also consistent, scoring at least 13 goals a season (with the exception of 1997-98, his first season with Tenerife) from 1996 to 2009. Perhaps his greatest crutch was that he was never seen as the face of a championship team. Ronaldo didn’t enjoy as consistent or healthy a career as Makaay, but led Brazil to a World Cup title. Henry, although never attaining European glory, spearheaded the “Invincibles” Arsenal squad. Makaay plugged away goals in Spain, winning a singular La Liga title with Deportivo in 2000, before making a then club record transfer to Bayern. He helped Bayern to two league titles, but the faces of that team were Michael Ballack and Claudio Pizzaro. Then his career started to dwindle down, slow and sure. I ultimately ranked Makaay seventh in my list, behind van Nistelrooy, Henry, Eto’o, Shevchenko, Trezeguet and Ronaldo and ahead of Villa, Forlan and del Piero. The next time you reminisce about the great scorers of the past, don’t forget “Das Phantom”.